Another holiday-season data update, another set of datapoints to go over. As this weeks’ data update is the first to contain updated DVD information since the holiday season started, I’ll be running through that along with the standard charts and commentary. 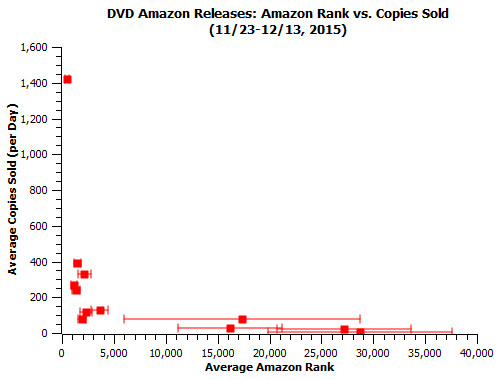 See here for the other 2 weeks’ worth of amazon DVD data. So I checked Jurassic World in the opus database again and it has been updated to be current to the most recent The Numbers update, which means DVD sales totals are now current to the week ending in December 13th. 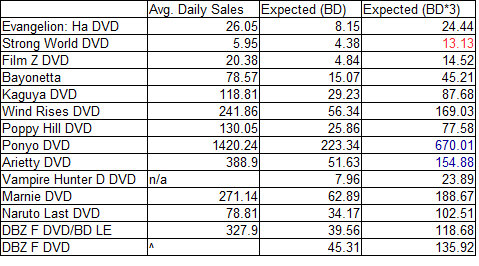 This means we can take the past 3 weeks’ worth of DVD amazon data and compare the expected sales values with what we see. It gives a bit less in-depth of a picture than using 1 week worth of data, but we still get a pretty good look. 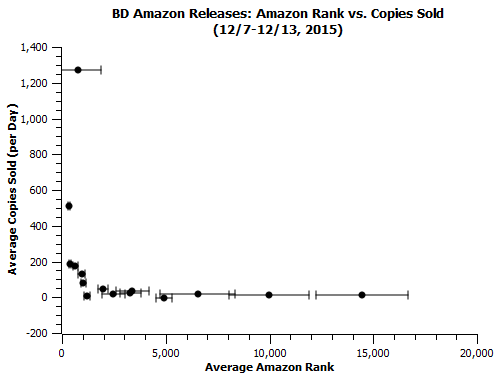 Note that for DVDs, expected sales for a given amazon rank are 3 times what they would be for BDs. It’s an observational fact that’s been discovered over the past 3 months of data collection. Ponyo and Arietty strongly outperform their expectations, and that’s pretty much it. Everything else is in line with what we’d expect from their amazon averages, given that they’re DVDs, to within a factor of two. Granted, a number of those other Ghibli releases (plus Bayonetta) outperform their expectations to a smaller degree – maybe there’s a more generally notable holiday boost for DVDs, which cater to a market less likely to shop at amazon? One thing you might see on the charts is the one BD datapoint with the huge error bars. That’s Attack on Titan: Part 2, which, somehow or another, juiced itself into the #18 spot on amazon for a day after spending most of the past couple of months in the low thousands. That one day at #18 is hugely valuable. 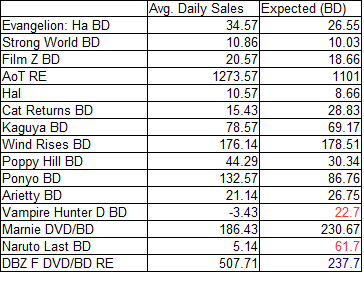 Formulaic predictions get tough below the top 50 because of the variance and a real lack of anime data in that range, placing it between the week’s #17 and #18 listed releases’ per-day sales (44,694/7=6385 and 38,219/7=5460) has it moving around 6000 copies that day. Combine that with spending the next day or two in the low hundreds (worth about 1000 copies more) and you can see how that short surge pushed the total up almost 9000 copies in a week. It’s still holiday season for this data process, so we can take a look at formula expectations versus reality in that department as well. Naruto was in the minus last week, I think it still might be losing some of that – 30-ish total sales in a week is abnormally low, especially given the typical output (~1000) for that release. I strongly suspect that was due to another week of negative additions cancelling out most of the positive sales, rendering the numbers useless. Not as useless as Vampire Hunter D’s (hasn’t been tracked for weeks and suddenly started decreasing), though! Other than that, the only real surprise performance comes from DBZ:F, which doubled its expected sales figures (as in the previous 2 weeks). Not coincidentally, it’s done so as a newer release that’s also fairly mainstream. I can’t tell you how good it feels to finally be somewhat on track here. There’s lots of interesting stuff coming out of the data now that it’s largely complete – the biggest one being that holiday sales boosts apply primarily to things that are either recent or have good non-amazon performance to begin with (especially with DVDs). And also that the formula I’ve developed is remarkably accurate so far, given the volatile nature of the market. Change can always invalidate a prediction model, but it’s nailing the majority of a lot of actual sales numbers right now. That’s basically the goal of this project, and it took less than half a year to get there. I honestly expected holiday boosts to be much for significant, given the well known adege that “Christmas accounts for half the profit” in retail. 1 – A lot of these movies are 2-3 years old. Pretty much all the biggest hauls in HV holiday sales come for current movies and earlier installments of ongoing franchises. Marnie/DBZ/Naruto are the only ones on this list that were issued fairly recently. 2 – Anime does most of its business online, but holiday shopping is a lot more based in meatspace. A neighborhood target or something is probability-wise much more likely to have copies of Jurassic World than of When Marnie Was There (in fact we probably saw somebody returning a five-digit number of The Wind Rises discs immediately prior to the holiday season). So when people go bargain-hunting irl, they don’t find copies of the latter at sale prices. 3 – Anime fans are younger and dialed-in enough to know when a coveted release is coming out, and many of the people who buy anime regularly may rather get it right away than wait 3 months for the gift.